Assoc. Prof. Zlatogor Minchev is the Head of IT for Security Department & Senior Researcher at the Institute of Information and Communication Technologies of the Bulgarian Academy of Sciences. He is also the Director of the Joint Training Simulation and Analysis Center. Computer science professional, combining solid theoretical and rich practical experience. Specializing in the fields of: cyber security, computer science, serious gaming, security sector governance, crisis management, defence planning, cybernetics, robotics, electronics, biosignal processing. Member of the: Union of the Bulgarian Mathematicians, Union of Automation and Informatics “John Vincent Atanassov”, Bulgarian Society of Physiological Sciences(2011-2016), NATO Research and Technology Organization (2006-2010), Editorial Board of the Journal of Defense Management, Association of the Officers in the Reserve “Atlantic” Managing Board (2012-2014), E-Sigurnost (honourable member since 2016), Association of Communication & Information Specialists (Deputy Chairman, since 2016). For his 15 years' scientific career Dr. Minchev has worked in a number of research institutes at the Bulgarian Academy of Sciences: Center for Biomedical Engineering “Prof. 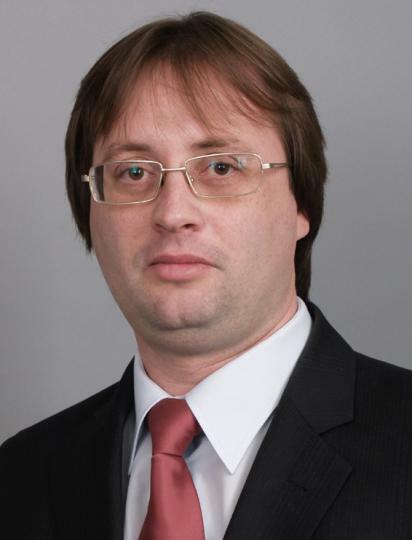 Ivan Daskalov” (2002-2004); Institute of Physiology (2005), Institute of Neurobiology (2006 - 2010); Institute of Mathematics and Informatics (2005 - ), Institute for Parallel Processing (2007 - 2010). In 2010 he was appointed as an Associate Professor on “Automation and Control” at the Institute of Information and Communication Technologies, Bulgarian Academy of Sciences. Author and co-author of more than 100 scientific publications (including 23 books and two patents) in the fields of: cyber security, computer science, serious gaming, security sector governance, crisis management, defence planning, cybernetics, robotics, electronics, biosignal processing . Works in field of security studies in a number of research and applied projects funded by the Bulgarian government, EU, NATO, USA and the non-governmental sector (2005 -). Director of the Joint Training Simulation and Analysis Center - an academic unit working in the field of applied modelling, simulation, Computer Assisted eXercises, Operations Research and cyber security (2007 -). Executive head of C4I Department at the Institute for Parallel Processing, Bulgarian Academy of Sciences (2008-2011). Works with young Bulgarian talents in the field of informatics and mathematics together with the non-governmental sector and the Institute of Mathematics and Informatics, Bulgarian Academy of Sciences (2006 -). Dr. Minchev is a co-founder of a European Network of Excellence in the field of cyber security - SySSec (2010 -). PhD on Cybernetics and Robotics, Bulgarian Academy of Sciences, 2007. BSc on Informatics and Mathematics, “St. St. Cyril & Methodius University”, Veliko Tarnovo, 2001. English language technical literature interpreter, High Technical School “Alexander Popov”, Sofia, 1997. Radio & Television technician, High Technical School “Alexander Popov”, Sofia, 1997. For his professional and team work Dr. Minchev has been awarded and distinguished with a number of governmental and international awards from: the President and the Prime Minister of the Republic of Bulgaria (2007); Ministry of Defence (2006, 2007), Ministry of Health (2008), NATO Research and Technology Organization (2007), Bulgarian Association of Information Technologies (2008), NATO C3 Agency (2010) and University of National and World Economy, Sofia (2010), Association of the Officers in the Reserve 'Atlantic' (2013, 2014), NATO CoE Defence Against Terrorism, Republic of Turkey (2014), Central Election Comission, Council of Ministries, Republic of Bulgaria (2016), Military Academy “Gen. Mihailo Apostolski”, Republic of Macedonia (2017). He has excellent working knowledge of English and Russian languages, as well as some French and German. Minchev, Zlatogor. Selected M&S Capabilities with Application in the Security Area In IT4Sec Reports. Sofia: Institute of Information and Communication Technologies, 2011. Minchev, Zlatogor. Bulgarian Emergency Management System In IT4Sec Reports. Sofia: Institute of Information and Communication Technologies, 2010. Minchev, Zlatogor. Five years research and development of information systems for security In IT4Sec Reports. Sofia: Institute of Information and Communication Technologies, 2010. Minchev, Zlatogor, and Ilia Nalbantov. For a new approach to the modernization of the Bulgarian armed forces In IT4Sec Reports. Sofia: Institute of Information and Communication Technologies, 2010. Minchev, Zlatogor. Information Processes and Threats in Social Networks: A Case Study In IT4Sec Reports. Sofia: Institute of Information and Communication Technologies, 2010. Minchev, Zlatogor. New Cyber Security Challenges In IT4Sec Reports. Sofia: Institute of Information and Communication Technologies, 2010. Minchev, Zlatogor. New threats in cyberspace In IT4Sec Reports. Sofia: Institute of Information and Communication Technologies, 2010. Minchev, Zlatogor. Threats and Challenges in Social Networks. A European Glance and Alliance Perspective in the Context of the New Strategic Concept In IT4Sec Reports. Sofia: Institute of Information and Communication Technologies, 2010. Minchev, Zlatogor. Joint Training Simulation and Analysis Center (JTSAC) Technical Report In IT4Sec Reports. Sofia: Institute of Information and Communication Technologies, 2009. Minchev, Zlatogor. White paper on the initial participation of Joint Training Simulation and Analyses Center in Computer Assisted eXercise for Crises Management In IT4Sec Reports. Sofia: Institute of Information and Communication Technologies, 2006. Shalamanov, Velizar, and Zlatogor Minchev. Analysis and adaptation of NC3A and NATO member countries’ models for analysis, estimation, decision-making, planning and management in emergency situations and support to the computer assisted staff exercises at national and regional level (SEE and the In IT4Sec Reports. Sofia: Institute of Information and Communication Technologies, 2005. Minchev, Zlatogor. Evolving Academic Contribution to the Development of Bulgaria's Emergency Management Capabilities In Early Recovery and Consequence Management in The Aftermath of Natural and Man-Made Disasters in the Greater Black Sea Area. Bucharest: Center for East-European and Asian Studies, 2012. Minchev, Zlatogor. Cyber Threats Analysis In On-Line Social Networks With A Study On User Response In IT4Sec Reports. Sofia: Institute of Information and Communication Technologies, 2014. Minchev, Zlatogor. Сигурност в дигиталното общество. Технологични перспективи и предизвикателства. In Юбилейна международна научна конференция "Десет години образование по сигурност в НБУ: състояние и перспективи пред обучението в условия на динамична и труднопредвидима среда". София: „Планета-3“, 2013. Balzarotti, D., E. Markatos, and Z. Minchev. "A Roadmap in the area of Systems Security." In The Red Book. SysSec Consortium, 2013. Georgiev, S., and Z. Minchev. An Evolutionary Prototyping for Smart Home Inhabitants Wearable Biomonitoring In Conjoint Scientific Seminar ‘Modelling & Control of Information Processes’. Vol. 12. Sofia: Institute of Mathematics and Informatics, Bulgarian Academy of Sciences, 2013. Minchev, Z.. Integrated Border Security Aspects: Bulgarian Academic Experience and Development Perspectives In International Conference “The Eastern Partnership: Assessment of Past Achievements and Future Trends”. Bucharest, Romania: Military Publishing House, 2012. Minchev, Z., and S. Feimova. Modern Social Networks Emerging Cyber Threats Identification: A Practical Methodological Framework with Examples In 6th AFCEA Sixth Young Scientists Conference 'Future of ICT', at NATO C4ISR Industry Conference. Bucharest, Romania, 2014. Minchev, Z., and L. Boyanov. Smart Homes Cyberthreats Identification Based on Interactive Training In 3rd International Conference on Application of Information and Communication Technology and Statistics in Economy an d Education (ICAICTSEE). Sofia, Bulgaria, 2013. Minchev, Z., and E. Kelevedjiev. Multicriteria Assessment Scale of Future Cyber threats Identiﬁcation In International Conference “Mathematics Days in Sofia”., 2014.